With this you can trace IP address info and IP address location (also in the form of big satellite images if needed) of any website or web server host. We have to say special thanks to Google Earth for making this satellite image tracing possible. Type cmd or command to get the command prompt window. Type tracert (and then then website name, eg: www.google.com) which starts tracing route to the website. As the tracing is done see where it says google.com which is generally at the last line of print. The IP address is next to that. That’s it! your IP-address trace is successful. You can get full information about your submitted IP address. If you want to see big satellite image of IP address under trace then click on the big IP address satellite image. 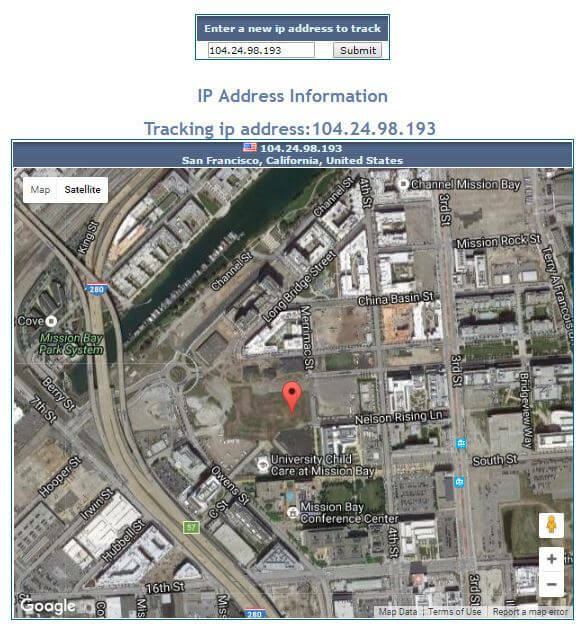 iptrackeronline.com has updated its IP Whois feature, which became very popular. Now if you ever wanted to know who is the owner of an IP address, simply type the IP address and click submit to get trace IP address and get detailed information about IP Address.